If you want to find out which version of a software library for your programming language of choice is the latest, you had to go the libraries’ website or the repository. Finding the website, the latest version and getting reminded on important bugfixes for the libraries you use can cost a lot of time. VersionEye is a website that tracks software libraries in 8 different programming languages and 7 package managers. Eg. if you are a Ruby developer you might be interested in the latest Rails, Sinatra or Capybara version. As a Java developer the latest versions of Spring, Guice or Hibernate might be of interest for you. If you regularly search for software libraries you may want to have a search engine directly in your browser. 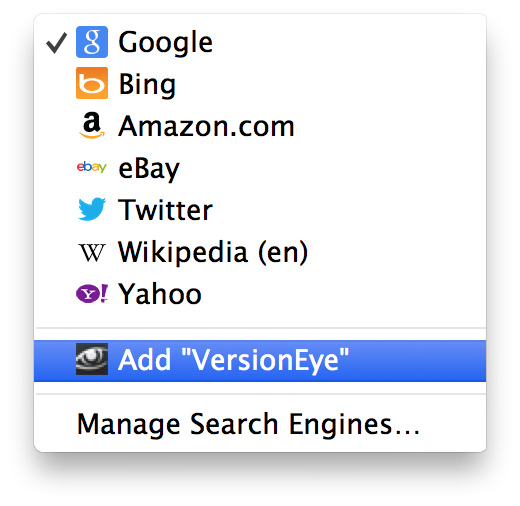 VersionEye now supports OpenSearch so you can add VersionEye as a search engine to your browser and quickly find out what the current version of your library is. 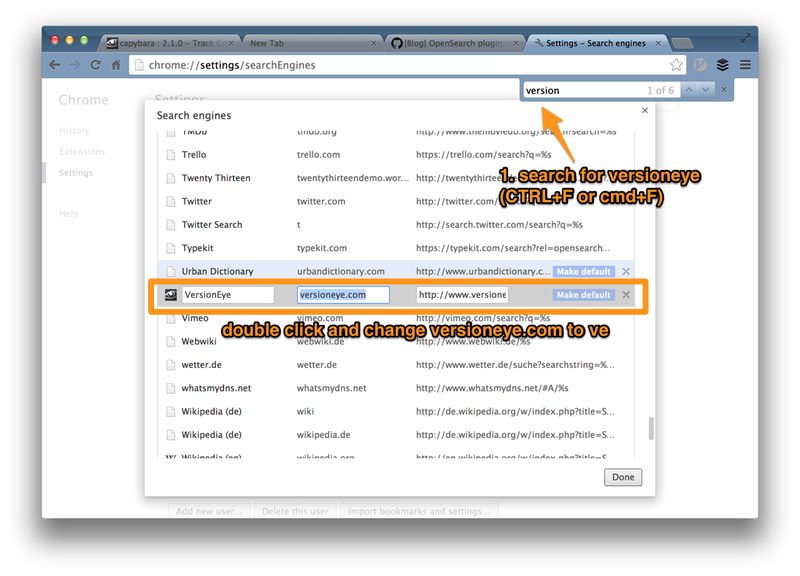 Locate the search box in the upper right corner of your browser. Click the small grey triangle next to the search icon and you will be able to add “VersionEye” as your new search engine for software libs. To make searching for libraries even easier, go into Chrome Settings for Search Engines (the URL is chrome://settings/searchEngines ) and search for VersionEye. Just change the key in the middle to something short to like ve and you can search for Capybara by just typing ve capybara into the Chrome Omnibox. We hope you like the post and you find VersionEye useful. If you would like to have a feature we don’t have yet, please let us know. Reblogged this on Robert Reiz. Pingback: Die SaaS Lösung “VersionEye” unterstützt jetzt CocoaPods - debros.info ----> Das Geniale ist immer einfach !